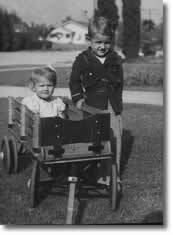 One of my most vivid memories was the wagon my father built for me and my sisters during World War II. That same wagon was recreated for my Dad at age 89. We will never forget the look on his face. There before him sat a l930's classic styled wagon, one almost identical to the one he had built for me and my sisters. 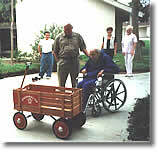 The wagon was presented to him at the Marian Extended Care Center in Santa Maria, CA. This 1930's classic with rear dual wheels is now available to you. It is called the Wagonmaster Classic. Now after 60 years, I have turned that memory into a retirement hobby and business. After 41 years working for the Sacramento City Unified School District, 28 of those years as a principal, I have retired. During those years, I have collected many antique wagons and have made several antique reproduction and modern wagons. I am now ready to continue making and selling wagons devoting more time to it. Each wagon is handcrafted at my home in Sacramento, CA. The antique wagons are "one of a kind" and sold as is or with some improved modifications. Some of the metal wagons have been completely restored. Each antique wagon will be described completely as possible to its history and authenticity. I am always open to new ideas and business opportunities for improvement. I would love to have you come by and see my collection of wagons.